Wireless headphones are officially so popular right now that every audio brand now makes a pair. One of those brands that has recently joined the club is Master & Dynamic, the maker of one of our most favorite pair of high-end and ultra-premium headphones. 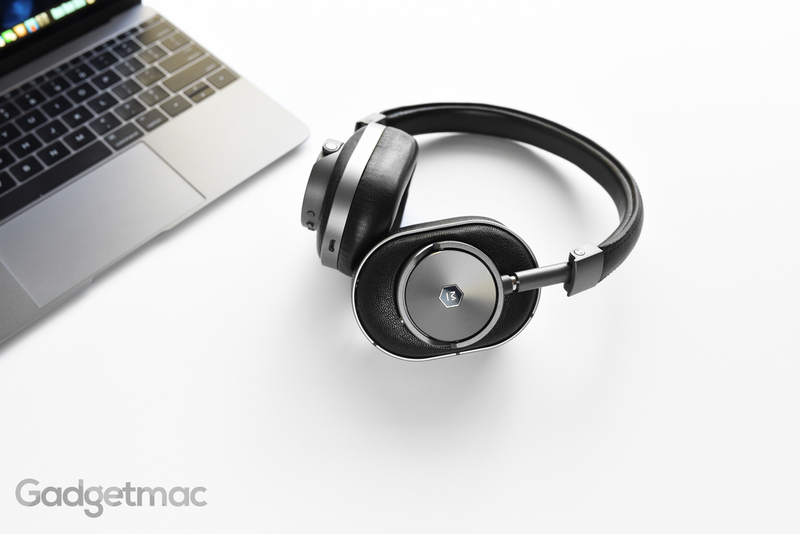 The company's new MW60 are the first over-ear headphones to feature wireless audio with the usual Master & Dynamic touch of excellence in style and build quality. With a premium price to match, the MW60 strive to be the finest wireless headphones money can buy. Because after all, we're talking about what is in fact the most expensive pair of wireless headphones you can get right now. That's right, $550 gets you a lifetime of enjoyment with Master & Dynamic's MW60. Wondering what such beautifully crafted headphones sound like? Wonder no more! Our full review has all the details. 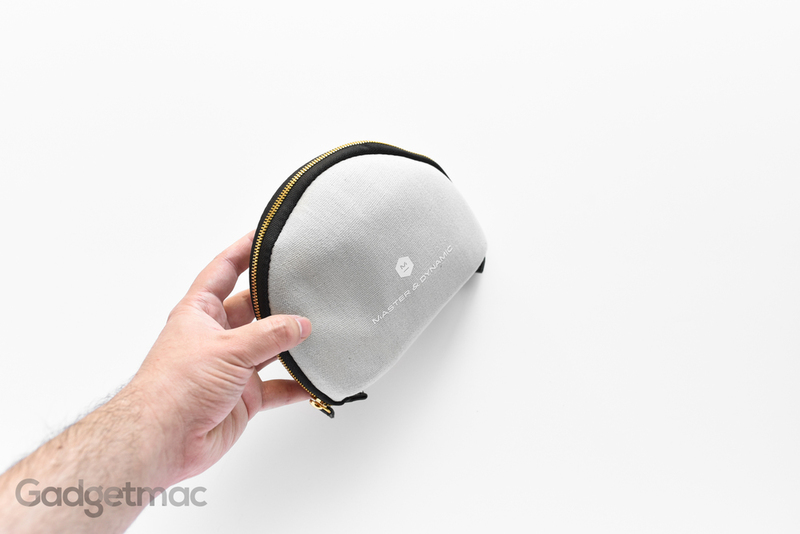 As with any product from Master & Dynamic, packaging and presentation are always on point. If you've seen one, you've seen them all. The MW60 are no exception and come with plenty of that wow factor when unboxed for the first time. Opening the flap reveals a thick foam tray with the headphones neatly tucked inside with a what looks like a genuine leather jewelry-like box bang in the middle containing the included detachable, 1.25m-long 3.5mm fabric-woven audio cable as an optional accessory for when you either get caught with a low battery or need to hook up to a source that doesn't support Bluetooth. Also included is a gold-plated 6.3mm adapter and of course the fabric-woven charging cable which is a standard USB to micro-USB cable with the Master & Dynamic branding. It's worth noting that this detachable audio cable isn't the same cable included with the MH40 with the impressive and robust knurled metal plugs, but I guess that's fine since you probably won't ever use it anyway. You also get a protective storage case made out of canvas featuring a golden metal zipper closure. Inside you can separate the cable accessories from the headphones using the included little accessory pouch. Because the MW60 can fold into a more compact and easy to carry form factor, they easily fit into this small travel case and take very little space inside a bag, unlike the MH40. Though at this price I would have prefered a hard shell case like the one provided with the Beats Studio Wireless for added protection. What's better than wireless headphones you say? Wireless headphones with active noise-cancellation of course. Sadly however, the MW60 do not feature active noise-cancellation but they are indeed wireless and very much expensive. 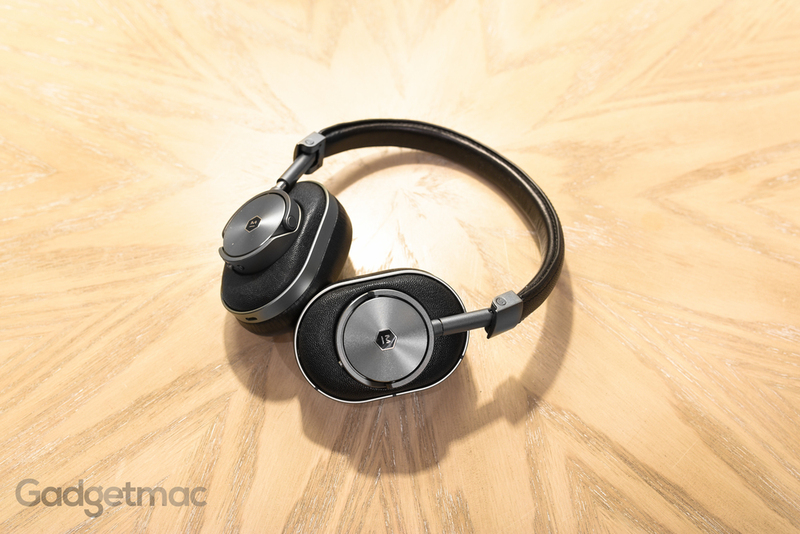 More so than other wireless headphones that also have active NC, which is asking a lot yes, but Master & Dynamic's MW60 aren't just another plasticky pair of headphones. They're made from the best materials you could ask for like leather taken from two different kinds of animals as well as stainless steel and aluminum construction resulting in a pair of ultra-premium wireless over-ear headphones that can fold up, have flawless wireless Bluetooth 4.1 connectivity, and last up to 16 hours on a single charge. Still, $549 is a lot of coin and the MW60 have some tough competition to face. 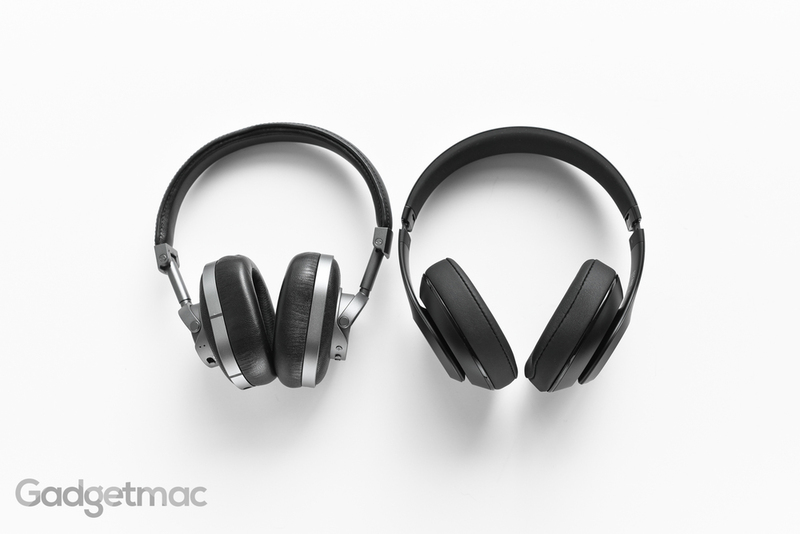 To put things into clearer perspective, the MW60 are more expensive than some of the best wireless over-ear headphones like the Beats Studio Wireless with active NC ($380), JBL Everest Elite 700 with active NC – including other more premium over-ear wireless headphones like the Sennheiser Momentum 2.0 Wireless with active NC, B&O BeoPlay H7 ($449) and the Parrot Zik 3 ($400). Even though they're styled differently, the MW60 are in many ways repackaged MH40. From having the same materials, amazing build quality, the same insanely comfortable oval ear pads, to the same large 45mm dynamic drivers tuned to warm and rich perfection. The only big difference being that they're completely wireless. They're also available in the same gunmetal with black leather and silver with brown leather colorways as the MH40 and the smaller MH30 from Master & Dynamic. The MW60 can be used passively using the included detachable audio cable when you run out of juice, or of course wirelessly using Bluetooth featuring high quality aptX audio codec. It's as if you've never cut the cord, yet free to go about your business whenever you'd like knowing that no cords will keep you from being chained down to your audio source like some slave. You've never felt freedom until you've used wireless headphones. The build quality and materials used to construct the MW40 are all absolutely brilliant. They actually feel like very expensive pair of wireless headphones. The MW60 are right up there with the build quality and precision of the BeoPlay H7 by Bang & Olufsen, however, they aren’t as light. Unlike the retro-looking MH40, the MW60 are more contemporary in styling and more simplistic looking. Each ear cup enclosure is beautifully forged out of solid aluminum and finished to a very refined, Apple-like smooth texture that screams of high-quality. You really need to hold one of these in person to truly appreciate the level of quality that oozes off of these. High-tension hardware like the height adjustment ear cup posts, hinges and ear cup arms are all made out of strong stainless steel. There’s literally no plastic used anywhere, at least not visibly. Even when removing the ear pads I found that the entire driver plate and grille are also made from aluminum. Nothing you see and touch is synthetic. Which is also why the MW60 feel this incredibly well made and uber premium. These are officially high-grade headphones. That being said, like the MH40, the MW60 are heavy compared to plastic made headphones. More so towards the bottom where those large and very accommodating ear cups are. So just keep that in mind before you choose a pair. You might be wondering what those black markers are on the left side of the ear cup. Those are Master & Dynamic's specially designed Bluetooth antenna that works much like the iPhone's aluminum separated antenna bands, which is the reason why the MW60 have such outstanding wireless reception and range. This is also serves as a very good Left and Right indication for correctly orienting and wearing the headphones on your head since the Left and Right markers are poorly visible. The MW60's cowhide leather headband does seem like a slight downgrade compared to the unique and much wider racing-inspired headband of the MH40. Nonetheless, both are equally comfortable and are sufficiently padded. Just like Master & Dynamic's non-wireless MH40 over-ear headphones, the MW60 are impressively comfortable to wear, even for extending periods of time. Extraordinarily comfortable even. And that simply isn’t something we can say about every pair of headphones that we test. The MW60 are about as comfortable as headphones come. Even more comfortable to wear than the Audio-Technica ATH-M50x, which means they can be worn for hours on end without any discomfort. The MW60 are among the few headphones I’ve used that feature such accommodating and deep elongated cups that give your ears room to breathe yet feel like they’re being hugged by the plump isolating ear pads. Like the MH40, the MW60 are closed-back headphones. Meaning they don’t have an opening in the ear cup housing behind the drivers to let air in and noise out. So when you put these on you do get a great amount of passive noise-isolation with very little audio leakage despite not having any active noise-cancellation technology. Thanks to extra-thick and very soft true memory foam padding covered in velvety leather courtesy of a lamb or two, the ear pads are nice and high creating a deep opening that doesn’t put pressure on them. As soon as you put these on, the MW60 do a pretty great job isolating you from the outside world and transport you to another. The experience of wearing these is highly pleasurable to say the least. Fortunately and like the MH40, the MW60 don’t have excessive clamping from the headband, which attributes to the high level of comfort they provide. The ear cups are attached to spring-loaded arms that keep them from moving around on their own while still allowing them to easily adjust automatically when worn. They can also rotate thanks to stainless steel hinges for an even greater degree of comfort and personal fit. To adjust the headband to fit your size, simply pull the headband and ear cup apart to set your desired height using the line graph etched onto the side of the post. The smooth action of the height adjustment doesn't afford the assuring ratcheting action of a regular headband so you may find yourself having to re-adjust your settings more often. Unlike the much shorter height adjustment length of the MH40, I'm happy to find that Master & Dynamic has increased the amount of headband adjustment levels on the MW60 to fit even larger heads. Metal button controls to adjust volume, play/pause, skip tracks as well as to answer/end calls can be found on the right side of the headphones where they're easily accessible and defined to the touch. The MW60 don't have a mechanical active mute button like the one found on the MH40 that simply mutes audio instead of pausing it. On the left side is where you'll find the multi-purpose power on/off and Bluetooth pairing switch followed by LED status indicators. You can find out how much battery you have left using the battery meter that shows up on iOS devices or the green, orange and red LED indicator on the headphones themselves by quickly sliding the spring-loaded power toggle all the way up. Of course it's not as detailed as the battery meter built into the Beats Studio Wireless, but it's good enough. When it comes to audio performance, Master & Dynamic has not tampered with the richness and warmth of the MH40 and essentially packed it all into a redesigned wireless package that'll cost you $150 more. That's not necessarily a bad thing since nothing had changed in terms of the premiumness and comfort that you also get with the MH40, but I think that charging $550 is definitely too much when the MH40 were already pushing it at $400 a pop. At $550, the MW60 don't offer anything more other than wireless audio. As much as some won't believe this, the MH60 don't sound noticeably better than less expensive wireless headphones like the Beats Wireless, not to mention they also don't offer active noise-cancelation when pretty much every other wireless pair do. Master & Dynamic accurately detailed and marketed the MW60 in that they produce a warm and dynamically rich sound using a pair of custom tuned 45mm neodymium drivers in order to best compliment a wide range of musical genres. The MW60 are indeed very rich, warm and have a well balanced sound signature. Highs are clean, well controlled and not overly bright. Vocals sound hearty while the midrange is as crystal clear as the highs and keeps a warm vibe with a decent amount detail and presence. Again, I wasn’t blown away by the MW60’s audio prowess having heard all sorts of headphones near this price range. They’re very reserved when it comes to laying down bass. The low-end sadly isn’t deep and resonating like I expected it to sound being that Master & Dynamic was going for a very warm and rich tonal sound. Unfortunately like the MH40, bass isn’t the MW60’s forte. So if that’s something you were hoping to get with these headphones, you’ll be disappointed with their audio performance. That said, I do think that the bass sounds laid back, clean, tight and non-fatiguing. We already know that the MW60 are better sounding than the lighter sounding Beoplay H7, but when compared to the Beats Studio Wireless, we’ve found that the MW60 didn’t sound any more convincing but rather unexpectedly on par throughout various kinds of music genres. Albeit, the Studio Wireless do sound just a bit brighter and not as warm as the MW60, which I actually quite like. It's nearly damn impossible for me to pick a favorite when only factoring in sound performance. Yes, they're that similarly sounding. And that's perfectly fine. However, this only makes it harder to justifying opting for the more expensive MW60 at $549. I don't think I like they're robust build quality that much over the much lighter, plasticky Studio Wireless. Though if I had to choose between the Beoplay H7 and the MW60, I'd definitely pick the latter. Master & Dynamic's MW60 and Apple's Beats Studio Wireless are both very comfortable headphones to wear for extended periods of time, uber stylish (although arguably one a little more than the other), and they both sound amazing. But which of these two should you get? Good question. If you value premium build materials and a noise-cancellation hiss-free audio experience when listening to anything other than music, the MW60 are an excellent pair of suave wireless headphones that will impress you every time you put them on. But if you don’t think some luxurious metal and leather isn't worth the premium price then the Beats Studio Wireless are some seriously good sounding alternatives with plenty of svelte polishing for a lot less, albeit at the cost of inferior durability. Maybe that's the reason why they come with a hard shell case? Ultimately, I enjoy wearing the MW60 the most as they provide that extra special feeling of superior craftsmanship. And for that reason will recommend them if only because they're the only wireless over-ear headphones out there that we think sound great but are also made out of top notch materials. So if you're looking for the best sounding, luxurious wireless headphones out there, Master & Dynamic's MW60 are the pair to beat...albeit overpriced.